Phuket is one of the world’s best-known island holiday destinations, with thousands of visitors arriving and departing daily. Phuket Island is connected to the Thai mainland by two bridges that run closely side by side named “Sarasin”, the original bridge (now a tourist walking bridge) and Thao Thep Krasatti, a modern four-lane highway bridge. These two bridges span the Prak Pah Strait, which connects this popular holiday mecca to the Thai Mainland province of Phang Nga. Although you can come by bus or car from Bangkok or other surrounding provinces, the majority of travellers reach Phuket Island through Phuket International Airport. Many affordable flights are available from Bangkok, other Asian cities and further afield. If you want to come by sea, you can arrive using private cruising yacht or ferry service from other west coast provinces of Thailand. The well established international train system, which also carries the famed “Orient Express” which still operates today, does not service Phuket Island or its adjoining provinces. It runs down the eastern seaboard from Bankok where it can be accessed at Phun Phin, close to Surat Thani, which is a 5-6 hour road journey from Phuket. On its journey south to the Malaysian border it slowly crosses from the east coast to the west coast of the Malay Peninsular through the southern regions of Thailand. It then follows the Malacca Straights on its Journey South To Singapore. Please check the following tabs for additional information. We have covered many helpfull items that will assist you in planning an enjoyable holiday. Despite travelling with kids is challenging, more often you can’t avoid your children. As far as known, Thais love children and adore them very much, as well as careful about children activities & their likings. To keep your baby entertained is not a question in Phuket. Plenty of temporary professional and child-friendly kids’ zones as well as nanny services are available here. Select the options you want to take and book them through online. Some hotels and resorts design their accommodation services for families along with their children. Some of them have kids’ club for making them lively. The trained female staffs are more careful about children matters. To grab this service, you should consult with the tour agent or representative of hotels before your booking. Don’t forget to forecast the weather for your next desired holiday. Ask your travel agent for suggestions of travelling with children. Keep first aid tool box including baby paracetamol, thermometer, anti-itching lotion, oral rehydration, and band aids. Take toys and favourite snacks. Carry essential items will be needed for your child. The travellers who wish to visit Phuket with their adorable pets from the outside of Thailand must follow Thai rules and regulations. The Animal Quarantine Station at Airport and livestock Department of Thailand have adopted some rules. Passport copy of the pet’s owner. Identification copy of the export agent. A copy of the rabies vaccination certificate. In case of exporting birds or other pets from Thailand, follow the rules of Departments of Forestry and submit the export consent certificates of the officers, Animal Quarantine Station at the airport or submit the required docs from CITES. Thailand is a food paradise where all amazing varieties of delicious Thai and International foods are prevalent. It is also popularly renowned for its startling use of herbs and spices in foods. Thai dishes that are very spicy and full of fresh (rather than dried) herbs attract the tourists most. When you see any spicy Thai food, you cannot keep yourself aloof from taking taste of it. plus rice. It generally includes soup, a steamed or grilled dish, a fried dish, a salad, a variety of sauces for flavoring vegetables, meat and fish, and dessert that may be sweet syrup, coconut cream, tropical fruit or sweet sticky rice. Phuket is a popular traveling destination where all kinds of Thai and International cuisines are available. Since Phuket is surrounded by Andaman Sea, all fresh sea foods are easily found at low price in most places of Phuket. 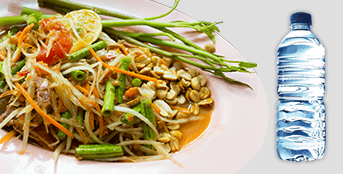 In famous restaurants and world class hotels all popular Thai dishes including Tom Yum Goong, Pad Thai, Pad See Ew, Roti Nam Geang, Massaman Curry, Oh Eaw, Por Pia, Homok Talay, Gad Med Ma-Muang, Homok Talay can be consumed. You can get fresh fruits and vegetables in every local market. Fresh water can be purchased from local stores in Phuket. The water of the luxurious hotels is solely safe and hygienic but cautions should always stick to bottled mineral water and sodas. Tap water is not safe to drink, and it can create some stomach problems. Because ice is produced in factories licensed and inspected by the government, it is totally safe for you. You can consume any beverages from local market, hotels and restaurants in Phuket. Shopping in Phuket is a part of your travelling experience. You will not fully enjoy your holiday in Phuket unless you go for any shopping. Phuket offers you a lot of shopping opportunities that include traditional Thai items, hand-made sculpture, fabrics, boutique items, and other essential things. Apart from roadside stalls and markets, there are a lot of big departmental stores, shopping malls as well as a good number of boutiques shops around the entire island. Most Popular of these are located in Patong Phuket, Central Festival (Phuket Town), Phuket Weekend Markets places, Patak Road and Taina Road. Jungceylon Mall in the heart of Patong Beach, Central Festival Phuket Mall on the western outskirts of Phuket City, Premium Outlet Phuket Center along the Bypass Road, Patong Promenade Mall at the corner of Bangla and Rat-U-Thit roads, Banana Walk Mall 100m south of Bangla Road, China Inn shop next to Kopitiam, Siam Indigo shop on 8 Phang Nga Road, as well as Fresh Markets on many beaches can highly be mentioned. Visit a shopping and you can make choices of your own. In Asian countries including Thailand bargaining is regarded as an art and is practiced very openly. Pricing in departmental stores & large retail outlets is fixed but at markets, small stores, shops and street vendors bargaining is the norm. So don’t forget to bargain and ask for getting a proper discount. You can expect to pay 10-40% less than the original asking price. And it totally depends on your bargaining skills and the will of the vendor. If you bargain with a smile you will be regarded. Many Thais work long hours, and so they expect a smile from a customer. If you’re not still satisfied with daytime entertainment you should not be frustrated. Phuket will offer you a wide range of stimulating amusement and nightlife you can never imagine. 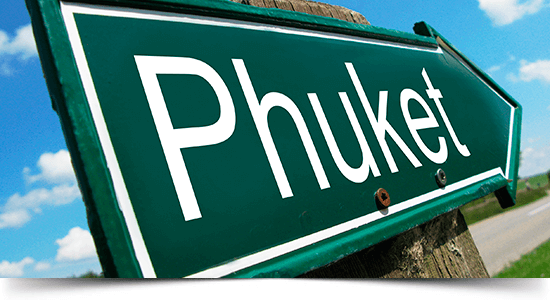 The main attractions of Phuket nightlife are discos, bars & pubs, restaurants, live bands, concerts and you name it. Though almost every tourist spot has some bars where you can have a drink, you will need to visit the main nightlife areas such as Patong, Kata, Karon or Phuket City since they’re very exciting and attractive. Soi Bangla is the most famous spot for nocturnal activities and unlimited nightlife entertainment. You can read a full overview of Soi Bangla road on this page. If you are planning to visit Phuket, you must know some rules and regulations regarding Thai immigration process. In order to visit Thailand your passport must have at least six-month validity remaining to be allowed to entry. You will not be allowed to enter Thailand in case your passport is damaged or has pages missing. Austria , Australia, Belgium , Bahrain, Brunei Darussalam, Canada, Denmark, France, Finland , Germany, Greece, Hong Kong SAR, Ireland ,Iceland, Indonesia, Israel ,Italy, Japan, Republic of Korea ,Kuwait , Luxembourg, Malaysia , Monaco, Netherlands ,New Zealand ,Norway , Oman, Peru, Philippines ,Portugal, Qatar, Singapore, Spain, South Africa, Sweden, Switzerland, Turkey ,United Arab Emirates ,United States of America, United Kingdom and Vietnam. You may apply for a visa at the Immigration Checkpoints Thailand only for tourism purpose for a period of not exceeding 15 days if you are a national and passport holder of any of the countries mentioned below: Bhutan, China, Cyprus, Czech Republic , Estonia ,Hungry, India, Kazakhstan, Latvia, Liechtenstein, Lithuania, Maldives, Mauritius, Oman, Poland, Russia, Saudi Arabia, Slovakia, Slovenia, Taiwan and Ukraine. If you would like to export Buddha images (except small ones carried by a person), antiques and original work of art you have to have export license (also called a Customs Card) from the Fine Arts Department of Thailand valid for three years. Foreign travelers are allowed to take out gold ornaments without a license. But if you would like to export or import gold other than jewelry into/out of Thailand you must have a license from the Ministry of Finance. The goods that are totally prohibited by Thai law to bring into Thailand are: any sort of obscene objects/literature /pictures, drugs or any type of narcotics (e.g. heroin, morphine, opium, cocaine, hemp, etc. ), any sort of pornographic materials, firearms, counterfeit trademark goods, IPR infringing goods (e.g. musical tape, CD, VDO, computer software, etc. ), fake currency & fake Royal Seals/official seals and some species of fruits, vegetables and plants. Nobody desires to think about anything that may go wrong on their travel, but this can and do happen while travelling. To avoid such an unexpected and unintentional accident you need some help from Travel Insurance. Travel Insurance covers all you need when you travel. It includes your medical help, help for canceling your trip, help when your luggage & devices (e.g. iPads, laptops, digital cameras, etc.) are lost or damaged, and help during scuba diving emergency. You will visit a personal doctor or a heath professional at least 4 to 6 weeks before tripping to Thailand to check whether you need any vaccinations or other preventive measures. If you inform us of any medication you are using, we can note it in your travel file. When you dive many drugs will behave differently. Thailand is a most sought-after healthcare destination. The medical services that a wide range of government hospitals, private hospitals, non-governmental organizations and private practitioners in Thailand provide are very excellent and of high quality. This is the reason for visiting Thailand by more than a million healthcare tourists every day. Please contact with travel Insurance company. Tipping anyone for some service is NOT customary in Thailand. If you tip anyone for their service it will be appreciated but NOT obligatory. Unlike the other parts of the world, you will never observe a Thai staff waiting for a tip. Tipping totally depends on your whim and intention. You will find the menu/price list as 456 THB++ at many hotels and restaurants. Hotels and restaurants frequently publish net price, and when you pay bill you’ll find bill added with a 7% VAT and a 10% service charge. In this case tipping a service provider is not expected. Tipping in Thailand can be counted as leaving the change from the restaurants or rounding the taxi fare up to an even number. 7% VAT is charged on all goods and services including meals and rooms. All public taxi rates in Thailand are metered, i.e. you don’t need to negotiate a fare. The taxi rate starts at 35 bath (approx. 1 USD) and stays there for the first 1 kilometer, and then the rate rises slowly. Though some selected department stores offer refunds for tourists, VAT is non-refundable. Because guides or crew for tours are not paid their salaries highly, they expect a tip for their service.